Thirst for Gold; or, The Lost Ship and the Wild Flowers of Mexico by Ben Webster. Tableau 2 was " The sea of ice." Jules de Valois (Captain of The Eugenie) was played by Charles Selby. "THE SEA OF ICE," AT THE ADELPHI. 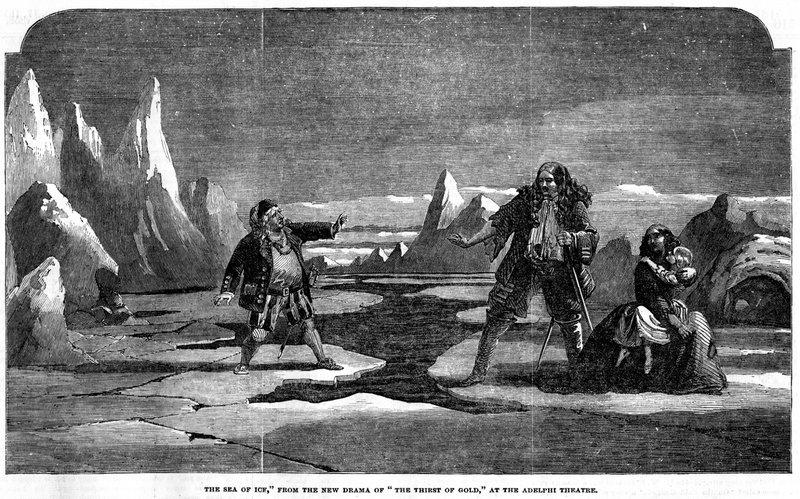 We this week present an illustration of the second tableau in the new piece produced at the Adelphi Theatre, under the title of "The Thirst for Gold." The scene in question is the "Sea of Ice." on which the commander of the Eugenie is cast, with his family, and Putney Will. We have already described the extraordinary machinery by which the icy surface of the stage is converted into a watery one while the hapless parents sink into the in-rushing sea, leaving their infant daughter on an ice-block, yet dissolved, and which floats her ultimately to a place of safety. The situation is, in all respects, powerfully rendered; and, illustrated, as it is, by scenery and machinery so applicable, is irresistibly effective. The acting of the piece throughout is capital. Mr. Webster, as the villainous Pedro, afterwards the Marquis D'Arvez, displays his usual tact and talent in the portraiture of cool and quiet rascality, which has become, as it were, the pattern-type now-a-days of the stage criminal. The accepted playwright of the present time eschews bombast verse, and affects a colloquial familiarity, which requires from the actor more intensity than vehemence. We doubt whether the recipe is not growing of too easy application, and makes, on every fresh occasion, fewer demands on both performer and dramatist: the character is, in fact, fast becoming stereotype, though it has not yet quite outlived its attraction. Madame Celeste's impersonation of the Mexican girl is decidedly picturesque and telling; while the development of the psychological elements requires more than ordinary intellectual acumen; and this Madame Celeste brings to the performance, and realises the difficult situations of the later scenes with equal truth and vigour. Putney Will by Mr. Keeley is also a rare example of eccentric acting. The idea of the character is somewhat outré. A British sailor, who mistakes his trembling impulse to partake in every row and to resist oppression of every sort, for the sign and symptom of cowardice; and then wonders at the deeds of valour he has performed, while in such a state of excitement. The assumption suits Mr. Keeley's style of acting perfectly. The part, unfortunately, only appears at short intervals; but it is so well interpreted that it is never forgotten. The drama, considered as a spectacle only, is eminently calculated for a long run.